Beyond what we already know about "food miles" and eating locally, the global food system is a major contributor to climate change, producing as much as one-third of greenhouse gas emissions. How we farm, what we eat, and how our food gets to the table all have an impact. And our government and the food industry are willfully ignoring the issue rather than addressing it. 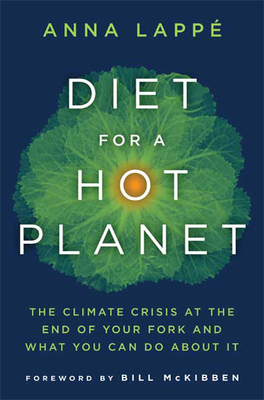 In Anna Lappe's controversial new book, she predicts that unless we radically shift the trends of what food we're eating and how we're producing it, food system-related greenhouse gas emissions will go up and up and up. She exposes the interests that will resist the change, and the spin food companies will generate to avoid system-wide reform. And she offers a vision of a future in which our food system does more good than harm, with six principles for a climate friendly diet as well as visits to farmers who are demonstrating the potential of sustainable farming. In this measured and intelligent call to action, Lappe helps readers understand that food can be a powerful starting point for solutions to global environmental problems. Anna Lappe is the co-author of "Grubb" and "Hope's Edge" (with her mother, Frances Moore Lappe)."" She is currently host for MSN's "Practical Guide to Healthy Living "and is co-host for the public television series, "The Endless Feast. "Named one of "Time" magazine's "Eco-Who's Who," she is a founding principal of the Small Planet Institute. Anna's writing has been published in the "Washington"" Post, Los Angeles Times, International Herald Tribune, "and Canada's "Globe and Mail." She writes a bi-monthly column on sustainability for "Spirituality and Health" and contributes book reviews to the "San Francisco Chronicle" and the "New Scientist." Her Web site is www.takeabite.cc."